Frank Lautenberg, Pope Benedict: Should elderly politicians make like the Pope and quit? Should Elderly Politicians Make Like the Pope and Quit? 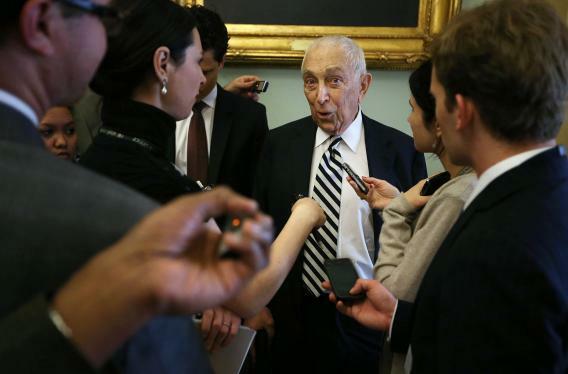 U.S. Sen. Frank Lautenberg (D-NJ) speaks to members of the press as he arrives at the weekly Senate Democratic Policy Luncheon at the U.S. Capitol on January 29. What the press ought to do instead is communicate reality: The burden of proof is entirely on Lautenberg to demonstrate that he isn’t too old to be an effective senator until the age of 98. Extrapolating from life table data, a 92 year old has only a 1 in 6 chance of living to 98, and that’s the combined rate for males and females. And those who do live to 98 have an extremely high rate of significant physical and/or mental decline. It should therefore not be some awkward responsibility for Cory Booker to hint vaguely about “new ideas”, “vigor” etc. as a way to gingerly raise the age issue. Rather, the press should put the question straight to Lautenberg: “Senator, if you are re-elected the odds are very low you will survive your term at all, much less do so in good health. Is that fair to the people of New Jersey when there are certainly other politicians in the state who could do the job?”. That keeps focus on a legitimate question that the public has a right to have answered (whether Booker brings it up or not). But coverage of Lautenberg goes just the opposite direction—it high-fives him for his vigor. A recent Philadelphia Inquirer story pointed out that the senator had returned from “a cold that became the flu” and was “wielding a cane—which he insisted he didn’t really need,” but otherwise focused on his “feistiness.” A Star-Ledger story quotes Lautenberg on the Bob Menendez scandal(s), but the quotes are nearly word salad: “I don’t want to be part of the external review at all. It’s much too sensitive a thing to be discussed randomly.” Someone else watching Lautenberg deliver some of these quotes (i.e., me) might say that Lautenberg walked slowly with the cane and took ages to make his point. Those details don’t appear in the stories because they seem subjective and mean. Rep. Gabrielle Giffords was unable to work while recovering from a bullet that penetrated her brain, and I can’t recall any mainstream calls for her to resign. The two members of the Senate who’ve suffered from strokes, Illinois’ Mark Kirk and South Dakota’s Tim Johnson, were robust guys stricken in their 50s. Johnson went on to re-election, and nobody’s telling Kirk he shouldn’t run again. Decorum plays a role here, as does the (mostly true) confidence that staffers can do most of a senator’s work. But should the media play along? Correction, Feb. 11, 2013: This post originally misspelled Joseph Ratzinger and Keith Humphreys’ last names.